My bod is fighting some sinus thing and while my usual is to push through (because I don’t like sitting still for too long), I am reminding myself when I do too much, my sickness gets worse and drags out longer. I’ve been making myself sit on this couch and chill for the last two days! But today, I’m excited to be back on it. This morning, I took my dog, Bell, for a walk and listened to the podcast, On Being with Krista Tippett. I’ve begun to incorporate listening to podcasts in the morning and this one I have found expands and challenges my perspective. They focus their shows around exploring ideas and questions about simply, being human. Today, I listened to an episode with Elizabeth Gilbert. Sure, sure, you may have fluffy opinions of her memoir, “Eat, Pray, Love” but I find she has some insight to offer. In this episode, she spoke about the creative life and how she chooses to follow curiosity instead of passion, as it is much more forgiving and friendly. And I agree, the word passion is charged. Passion can refer to our intimate lives, our creative lives, our purpose and it can be confusing, rich, deep and sometimes, lost. After listening to that podcast, I felt motivated to take some pics of this gorgeous mural that has been catching my eye, located on the walls of Disjecta Art Gallery. I left my house and was excited to find the parking lot empty, all the better for me to play around with my Sony Alpha 6000 camera and capture some full shots. Woo! Here are a few pics below. 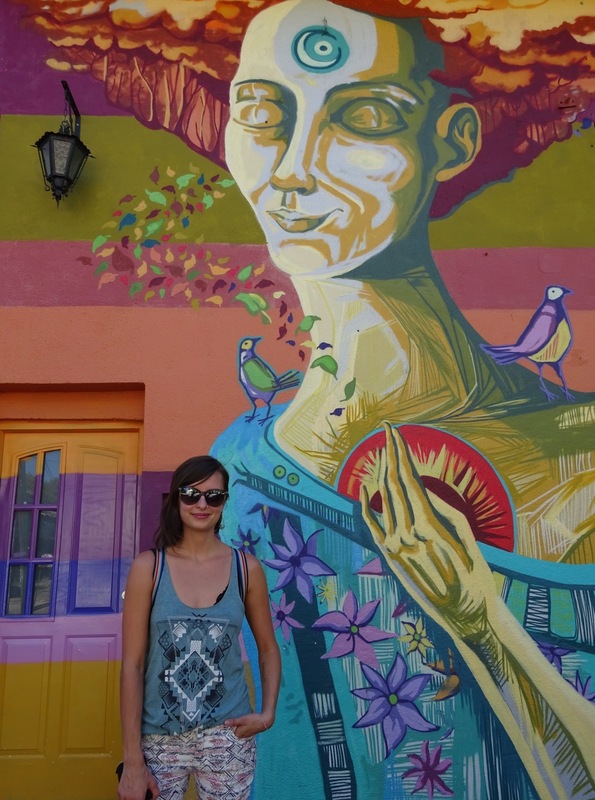 When I arrived to Buenos Aires I absolutely loved the colors and the countless graffiti pieces, tags, and murals. Buenos Aires is clearly a city in which writing and painting on buildings is (almost) legal. One day, I passed a younger Porteño dude throwing up a piece during the day. There happened to be a police officer standing on the corner and it appeared he did not mind the graffiti. I stopped, watched and asked him about the BA graffiti scene. His accent was thick and so it was a bit of a guessing game, but he ended up taking me to a nearby park that was covered in graffiti and murals. I later went on both the graffiti tours that are offered in the city–Graffitimundo and BAStreet Art. I found out that people have been writing political propaganda on walls for years. This created a culture in which graffiti is permitted and is everywhere. I mean everywhere! Business owners often would rather have a mural on their business than deal with removing the continuous onslaught of tagging. So when I stumbled upon Cuore, I completely fell in love with the softness and beauty of her work. Carolina Favale, otherwise known as Cuore, which translates to ‘heart’ in Italian, has been painting on walls since 2010. This lady is constantly painting and I love it. In this two-minute interview she did (in English! ), she briefly talks about her art. I love her philosophy on her work. Because she lives outside of the Federal Capital, I have been unable to visit the majority of her murals. Most of them she has completed in her own neighborhood, but at least I was able to visit those below! This mural, La despedida, was painted for Ciudad Emergente, which is one of the art festivals organized by the city. La despedida translates to farewell or goodbye in English. Appropriately it is at the Cultural Center of Recoleta. Buenos Aires has many dedicated cultural centers; this one specifically is in a heavily trafficked and tourist area. Very nearby is the famous Recoleta Cemetery and every weekend there is artesenal vendors that set up in the park. When I took this picture I thought that due to the light, I would have to come back to snap a better photo. When I viewed it a few days later, I absolutely loved the light, and how the plant accented the piece. I saw this piece while riding the bus. I was so excited that it was within eight blocks of my house. After doing a little research, I found out that she completed this mural during a festival called, “Meeting of Styles.” Meeting of the Styles is a street art festival held around the world in different cities, and this specific year it was in Buenos Aires. I love how she portrays this curvaceous woman with swirling energy about her. In many of her murals she depicts women, and I have often seen her connect points of energy within the body. Here is my translation of the saying on the bottom, right corner. Ingobernables son el corazon que siente la mente que piensa los manos que hacen. Uncontrollable is the heart that feels the mind that thinks the hands that do. And the I was able to see the header image, Sapiencia. while visiting my friend, Isa, in San Isidro. Conveniently, this is located around the corner from her house. Sapiencia means 'knowledge' and appropriately is located on the front of a small cultural center that hosts various classes. I was able to peek in and see a yoga class in action and see acrobatic equipment hanging from the ceiling. I plan to get to this lady's neighborhood before I leave the country and will upload more of her work. Also Urban Canvas is another great site to peep graffiti from around the world. I found a number of Cuore's pieces on this site.